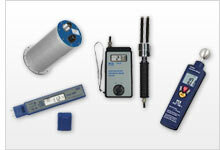 Explore PCE Instruments' absolute moisture meter offerings. Our absolute moisture meter products can measure relative air humidity, while our combination devices can also measure temperature. Each absolute moisture meter measures different ranges of humidity, depending on the model. Relative humidity is an important factor in everything from gardening to transport and industry. Our absolute moisture meter products are versatile, as they can take measurements, store the data to memory and transfer the data to a computer for detailed analysis. Different moisture probes that correspond to the materials to be measured can be connected to each absolute moisture meter. For most of the materials, you will find calibration curves within the internal memory of our absolute moisture meter products. You then only need to select the appropriate calibration curve for the material you wish to measure. Absolute moisture meter tools are used to determine the moisture in walls, concrete, attics and wood, as well as in the field of agriculture to ascertain the correct time to plant a crop to achieve the highest yield. If you have any questions about the absolute moisture meter products on this website, please contact us at or +44 (0) 2380 987 035 for PCE Instruments UK, or at or +1 (561) 320-9162 for PCE Americas Inc.
PCE-SMM 1 is an absolute moisture meter for soil ideal for use in agriculture, crop science, horticulture, botany, landscaping, gardening and environmental testing applications. This portable handheld moisture meter or analyzer measures soil moisture or humidity quickly, easily and accurately. The Absolute Moisture Meter POCE-W3 is designed for professional use in the input control of large amounts of waste paper or containers of paper. The Absolute Moisture Meter can detect absolute humidity in waste paper in order to determine the exact humidity content in the collection centre or in the paper-making factory. All test instruments come manufacturer calibrated. ISO certification can be ordered as an option. PCE-WP21 is a concrete absolute moisture meter used to perform noninvasive, nondestructive moisture measurements of concrete construction and building materials. An ideal tool for assessing the drying and curing of concrete slabs, footings, foundations, floors and more, this moisture meter uses electromagnetic waves that penetrate approximately 50 mm / 1.96 inches deep to return a mean-value moisture content percentage. PCE-WMH-3 is a portable handheld digital absolute moisture meter or analyzer used to measure the moisture content of wood. This hammer-style wood moisture analyzer features preset characteristic curves for measuring moisture in 270 different wood types. PCE-MMK 1 is a portable handheld digital moisture meter used to measure the moisture content of wood, paper, textiles, concrete and other building materials. This multifunction absolute moisture meter also measures ambient temperature and ambient relative humidity. PCE-WP24 is a timber absolute moisture meter used to perform noninvasive, nondestructive moisture measurements of wood, timber and other construction or building materials. An ideal tool for assessing everything from lumber to floors and more, this moisture meter uses electromagnetic waves that penetrate approximately 50 mm / 1.96 inches to 60 mm / 2.36 inches deep (depending on substrate) to return a mean-value moisture content percentage. PCE-WM1 is a multi-function absolute air humidity meter used to determine relative humidity (% RH), absolute humidity (g/m³), air temperature, dew-point temperature and surface temperature (°C). This Metric-only measuring instrument comes complete with an external sensor probe for taking the surface temperature of different materials. PCE-MA 110 is an absolute moisture meter or halogen moisture analyzer that functions on the gravimetric or loss on drying (LOD) principle. The moisture analyzer uses the halogen method to dry the material sample. Moisture content is calculated based on the weight difference before and after the drying procedure. Calibration of the moisture analyzer can be performed at any time using the automatic calibration function and the included 100 g weight. The PCE-MA 202 is an oven-drying absolute moisture meter for weighing and heating material samples to determine moisture content. The heating chamber warms up to 199 °C / 390 °F with the use of halogen lamps. Drying of the sample to be weighed takes place within the chamber of the absolute moisture meter and the moisture content is subsequently calculated from the difference between the initial and final weight. The absolute moisture meter PCE-MA 100 allows different materials to be weighed and their moisture contents determined. The heating chamber is heated by halogen lamps up to 199 °C. In this chamber, the absolute moisture meter dries the material to be weighed, and then calculates the moisture content from the weight difference. The absolute moisture meter PCE-MA 200 is used to weigh a range of substances up to 200g / 7.05oz and measure their moisture content. A halogen lamp heats up the chamber to 199 °C / 390 °F. The absolute moisture meter dries the substance to be weighed within the heating chamber and determines the moisture content from the difference in weight. The PCE-A-315 inline moisture sensor provides exceptionally accurate grain moisture measurement in real time. The PCE-A-315 in-process moisture meter uses low-power microwaves to penetrate the surface every 0.2 second and obtain interior moisture readings without causing any damage. An integrated temperature probe ensures the readings are accurate from 5°C to 55°C / 41°F to 131°F. Suitable for the continuous monitoring of moisture in corn, soybeans, wheat, rice, sorghum, barley, oats, rye, hops, coffee, cocoa beans, oil seeds, flax seeds, sunflower seeds, poppy seeds, pumpkin seeds, spelt seeds, buckwheat, sesame, peas, fava beans, scarlet runner beans, triticale, amaranth and jatropha.